Google added a very Passbook-like feature to the Google Search app via an update Wednesday. 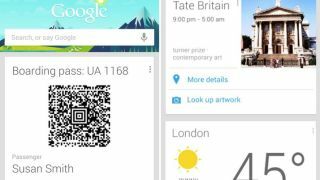 The app's Google Now feature, which is evolving at an amazingly rapid rate, now scans through travelers' Gmail accounts for flight boarding passes, automatically pulling the info up in a QR code. Only United Airlines is part of the program now, but Google promises there are more to come. iOS 6's Passbook also offers boarding pass pull up in the exact same fashion for United, though it counts American Airlines as a Passbook passenger as well. Once you touch down, Google Now will even help you plan your trip - whether it's pulling up nearby events or suggesting websites for to-do research. An updated camera search feature brings up information on specific items at museums through Google Goggles. The update also makes Google's Siri-competitor Voice Search more powerful. Say a song is playing on the radio and you just can't place the notes - asking, "What's this song?" brings up the name of the tune. "Scan this barcode" pulls quick product info and voice-only posts can now be made to Google+. The update is available for Android 4.1: Jelly Bean devices and up through Google Play.